Hello Friends, Happy weekend to you! I don’t know about you but, I am super excited it’s the weekend. I am hoping for more coloring time. What are you wishing for? Thursday I shared this Aeonium African Succulent from Picket Fence Studios and I am happy I was able to finish. It can be hard to turn out the lights and go to bed when you want to keep on coloring lol. That’s a good problem to have. In the quick video I am showing you how I watercolored a few of the petals with the Tombow watercolor markers and some distress ink. These leaves almost went in the trash from a previous card good thing I kept them. They worked well on today’s card. Using an antique salt and pepper glass dish is such fun! The best part is I don’t have a big jug of water to dip in and when the water changes color it works to your advantage. You will be using more colors! On instagram it’s been difficult to leave comments because IG keeps shutting me down for most of the day! Trying to stay positive! I get such joy to see what you all are doing. I am keeping tabs on my blog too and will leave comments later. The 3rd way is to link up to my blog to share your coloring click here to link up. 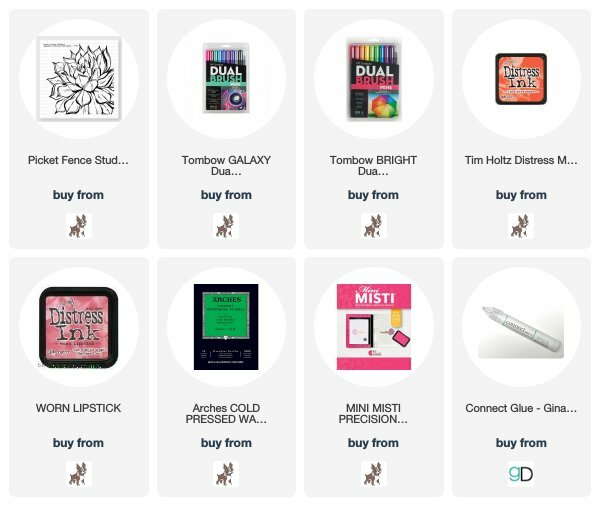 Card Supplies and Links: Affiliate links are used to support 100% of my Coloring Challenge Road Trips at no cost to you. The 30 Day Coloring Challenge is back! Truly beautiful as your coloring always is! I love that you made a video of colouring this awesome piece. Learn always from you. Yes, I know Lydia’s blog and she is also a great artist. Thank you Kathy, I see you tomorrow and have a great Sunday. Thank you so much for doing this video, gorgeous flower, so much space to shade & so many structured lines. I do like Picket Fence stamps. Thanks for doing the video on this! When I saw the early project, I couldn’t envision how you’d painted it and thought, “gee, I wish I could see her coloring this!” 🙂 You read my mind! That stamp from Picket Fence is so wonderful. Of course it is even more so with the lovely job you did coloring it. Thanks for sharing this, I might have to get that stamp. Fabulous coloring!! Love this giant stamp!! I love listening to you; adorable! And your work is a-maz-ing!!! This is gorgeous! What an awesome coloring job you did on that succulent! I love it! That is stunning! Love the colors! Loved it, of course. But I have to say, in addition to your phenomenal sense of color, and your patience you DO have a very steady hand. Wish I did! This is gorgeous and I love to see people still using Tombows occasionally. So bright and vibrant but apparently out of style. Thank you so much for the video Kathy. I really love your videos! I know you haven’t been posting quite as many recently, so I really look forward to them when they occur. Loved the video. It was so exciting seeing the colors and the flower come to life. This is just stunning Kathy! Love that stamp too. And I really love your antique salt and pepper shakers. I need to start using a smaller dish for water!! So, so gorgeous! I adore the colors on this card!! It is sad what Instagram is doing because we miss your commenting. Gorgeous! Love your videos. I learn so much! I love how you did that watercolored flower! It is so pretty! Do you use water color paper for your water coloring? I have some but the pad is so huge & I would have to cut it all up to be able to use it. I usually use just your basic card stock when I use my Twinkling H20’s which are my favorites by the way. I love that stamp too but it looks like another stamp I have & not the flower but the size. I have child sized hands so the bigger stamps are hard for me to use. I have trouble getting the whole stamp to print when the stamp is to big. I love Mandala stamps but the one I have & the one’s I’ve seen are just to big for my small hands to use. I wish companies made some smaller ones for people like me. Did you see I posted something? So far, it’s all I can post. I sent two e-mail’s to the company that runs how we can post here & I am waiting to hear from them again. I’m making Valentin’s & I want to post them! I did a lot of coloring tonight & my Valentine’s look colorful. I can’t wait for you to see them! Absolutely GORGEOUS! Thanks for the video! You colored this so very beautifully Kathy!!! I love how it came out! As I type, it’s Day 11 and this is my favorite of yours so far. So very beautiful! This is such a beautiful flower and perfect for water colouring. Great tips Kathy. TFS! So very amazing! I feel like I learn so much each time I watch you do something. I took away so much from this video and I can’t wait to try some of your tips the next time I use my tombows to paint. Beautiful work, big sigh.